Keith Dale Miller, (May 3, 1942 - April 13, 2014), devoted father, brother, English teacher, counselor, and coach, died Sunday, April 13, after a short bout with Pick's disease (a fast acting form of dementia). He was 71. 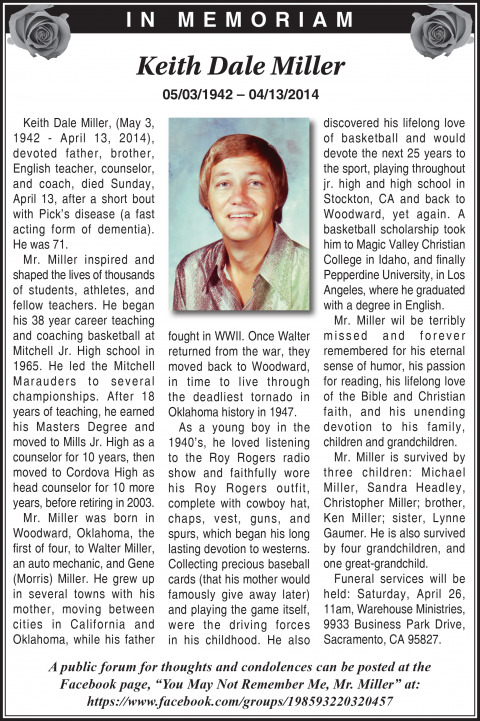 Mr. Miller inspired and shaped the lives of thousands of students, athletes, and fellow teachers. He began his 38 year career teaching and coaching basketball at Mitchell Jr. High school in 1965. He led the Mitchell Marauders to several championships. After 18 years of teaching, he earned his Masters Degree and moved to Mills Jr. High as a counselor for 10 years, then moved to Cordova High as head counselor for 10 more years, before retiring in 2003. Mr. Miller was born in Woodward, Oklahoma, the first of four, to Walter Miller, an auto mechanic, and Gene (Morris) Miller. He grew up in several towns with his mother, moving between cities in California and Oklahoma, while his father fought in WWII. Once Walter returned from the war, they moved back to Woodward, in time to live through the deadliest tornado in Oklahoma history in 1947. As a young boy in the 1940's, he loved listening to the Roy Rogers radio show and faithfully wore his Roy Rogers outfit, complete with cowboy hat, chaps, vest, guns, and spurs, which began his long lasting devotion to westerns. Collecting precious baseball cards (that his mother would famously give away later) and playing the game itself, were the driving forces in his childhood. He also discovered his lifelong love of basketball and would devote the next 25 years to the sport, playing throughout jr. high and high school in Stockton, CA and back to Woodward, yet again. A basketball scholarship took him to Magic Valley Christian College in Idaho, and finally Pepperdine University, in Los Angeles, where he graduated with a degree in English. Mr. Miller wil be terribly missed and forever remembered for his eternal sense of humor, his passion for reading, his lifelong love of the Bible and Christian faith, and his unending devotion to his family, children and grandchildren. Mr. Miller is survived by three children: Michael Miller, Sandra Headley, Christopher Miller; brother, Ken Miller; sister, Lynne Gaumer. He is also survived by four grandchildren, and one great-grandchild.